"Quick recipe that can use just about any fruit." Arrange the apricots in a 9x12-inch baking dish and sprinkle with white sugar. Mix together brown sugar and flour in a bowl; cut in the butter with a pastry cutter until the mixture resembles coarse crumbs. Lightly stir in the rolled oats and spoon the mixture over the apricots. Bake in the preheated oven until the fruit is soft and the topping is browned and crisp, 35 to 40 minutes. Wet gloppy mess. I even tossed the fruit in extra flour to absorb moisture. This did not get crispy, just a mushy dish of mush. 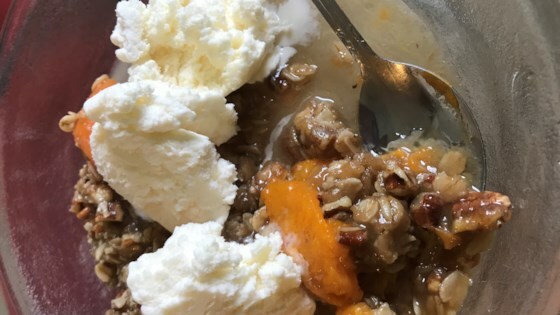 This was really good, but next time I would use 4 cups apricots with 2 tablespoons sugar and then put it in a 8 by 8 pan with half amount of topping to give a better fruit to topping ratio. Really good my Teenage boys couldn't get enough. It was the perfect blend of tart and sweet! my family LOVED this. you could use any fruit you want in this and it's really good! I enjoyed the flavor of the fruit,sugar, butter, etc. I will use this part of the recipe in the future. I am going to find another topping recipe (sugar, flour, butter,oats, etc.